“It all happened in the past and that’s where it should stay?” would be my usual response. Even to this day when speaking of past experiences, I tend to leave it all in the past. I could never see the reasons behind dredging up the past to learn from. Do we actually learn not to make the same mistakes or was it merely the power of suggestion for some to be challenged by? Some figures within the deaf world have published books and held lectures on deaf history. Once again, I find myself within that zone. “Do we really have to listen to that record?” I would ask myself. Someone once implied we should listen to our forefathers and take heed in order not to make the same mistakes they did, in this day and age. I pointed out that in the olden days the attitudes and times then were different to today’s so why should we have to listen to what was said before our time and follow suit? When its the present society we should be listening to, adapting to and learning from in order not to make the same usual delayed reaction like generations before us have done so. Walking through the bustling streets of London, I tend look up to admire the architecture whilst everyone else grudgingly looks downwards. Every being, structure has its own story to tell, in their own unique ways. The opportunity arose to see the Supreme Court of United Kingdom. I felt a spark of interest. Purely because I have a genuine interest in the Law and worked at the Immigration Appellate Authority. But, this tour was the first one they would be trying out with STAGETEXT, live captions on a tablet. I had never experienced this form of communication support in the past so felt rather intrigued, seized the day and reserved myself a ticket knowing a few friends were also going. Two birds with one stone. Upon arriving at Westminster tube station, I was at once overwhelmed with how touristic London had become. Cameras were in full force everywhere, motors revving past, the chatter of people, and the whirlpool of colours – spinning all around me. Then there was this idyllic backdrop in all its splendour, Westminster, The Houses of Parliament and Big Ben standing very proudly, tall and yet so intricate. Having spotted my friend Rich, we decided to impersonate tourists ourselves by having our photo taken with Big Ben in the background. The hustle and bustle all around reminded me of the “Hands on ears” deaf awareness campaign so I asked this lovely lady if she would take a picture for us, of us. She smiled and willingly obliged. I suggested to Rich, “Let’s put our hands on our ears!” The lady seemed to question “Why hands?” in such a way that I realised she might be deaf aware so indicated I would explain after. She understood my body language. 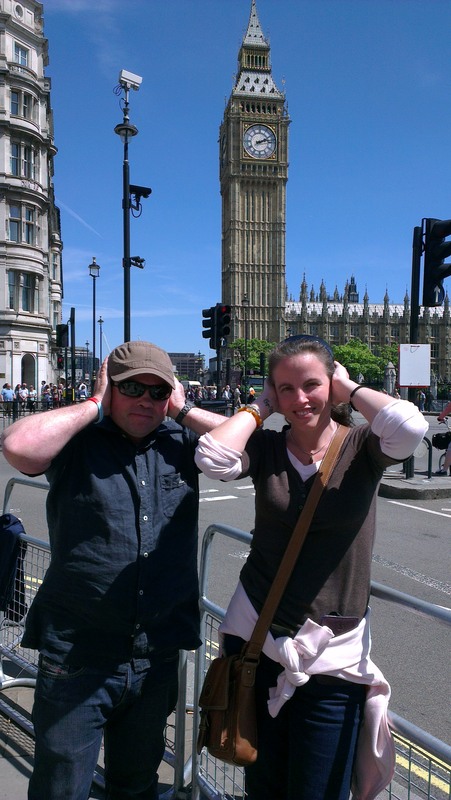 How strange but nevertheless posed for the #handsonears photo with our positive support regardless. Intuition encouraged me to ask her, if she could sign. She smiled and signed “Yes” We smiled too in wonder, consequently holding a brief natter. What are the chances of that?! A tourist, who knew sign language supposedly had to cross our paths, right there and then. Making our way to the Supreme Court, there stood a grand looking building decorated with stone carvings, sporting the Royal Coat of Arms. Walking through the front doors was like going back in time but with hints of the present and future. It was a mix of old blended in with the new. This was because the old building over time wore out and since restoring and renovating the building as it had previously used to be a courthouse, Guildhall and then a Crown Court better known as the “Middlesex Guildhall” before being chosen to date, the location for the Supreme Court. The stone walls and original chandeliers looked at home side by side engraved glass panels with combined phrases from the Judicial Oath et cetera. 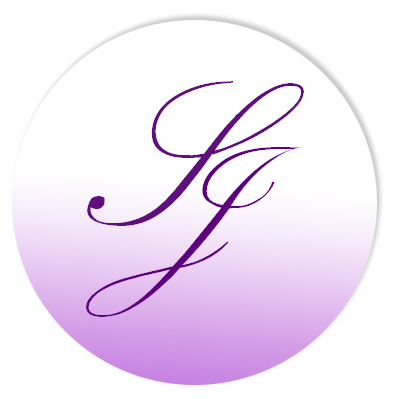 Holding the tablet for the very first time, I had no idea what to expect. How did it work? I asked a very kind new face which I could now put to her name. She explained that it was all through Wi-Fi. The speaker would usually have a microphone that someone would listen from and type, which sent out live subtitles over Wi-Fi. I was a little dubious knowing how bad live subtitles were on the TV. Much to my delight, which at first was a very surreal moment, the subtitles started flowing on my handheld screen – I looked up and around me, smiling seeing how everyone was following with ease. Equally. It is a bit like seeing all the passengers around you on the tube looking at their phones but in a different setting, for entirely different reasons. It was amazing how this technology worked, so quickly and accurately. 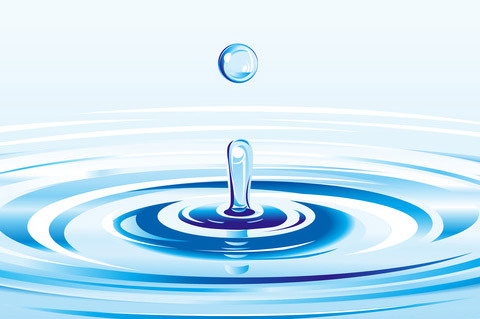 As it was their first time, it was only natural there would be patches of areas where the signal cut out and tablets had to be rebooted but knowing the speaker was achieving this via a Skype phone call, who on the other end sat a most patient lady called Wendy. I have to say, I was very impressed. It was nothing like I envisaged it might be but better. Kudos to STAGETEXT for all their hard work in order to overcome barriers on an united and equal basis, so we could enjoy this experience we would never had been able to fully enjoy or understand without them. 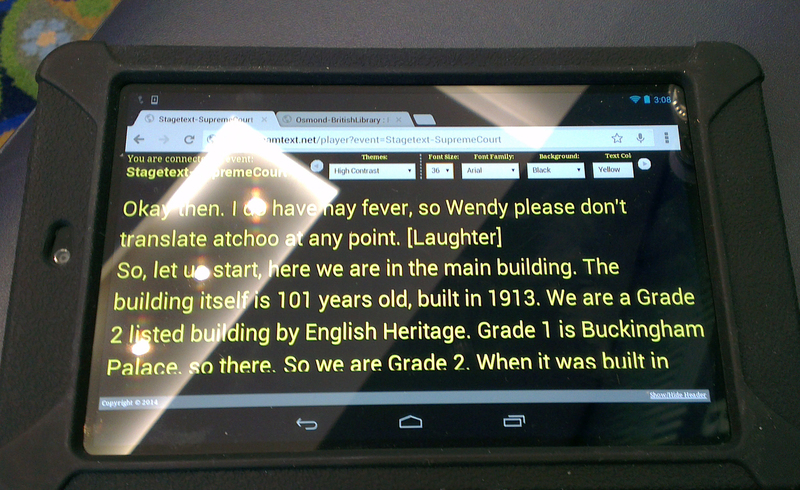 Live captions on a tablet. On the first floor, there stood courtroom two and this huge impressive glass wall. 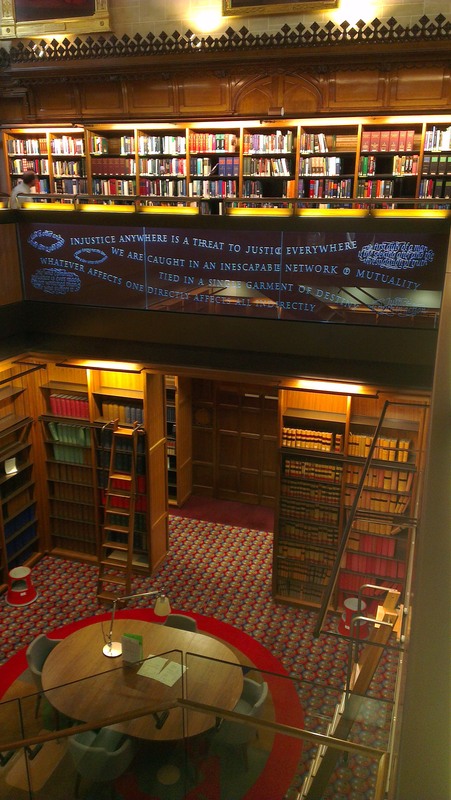 An inspirational quote from the human rights campaigner Eleanor Roosevelt, which read “Justice cannot be for one side alone but must be for both” This stopped me in my tracks because it was extremely clever the way they designed it, to run along both sides of the glass panel. 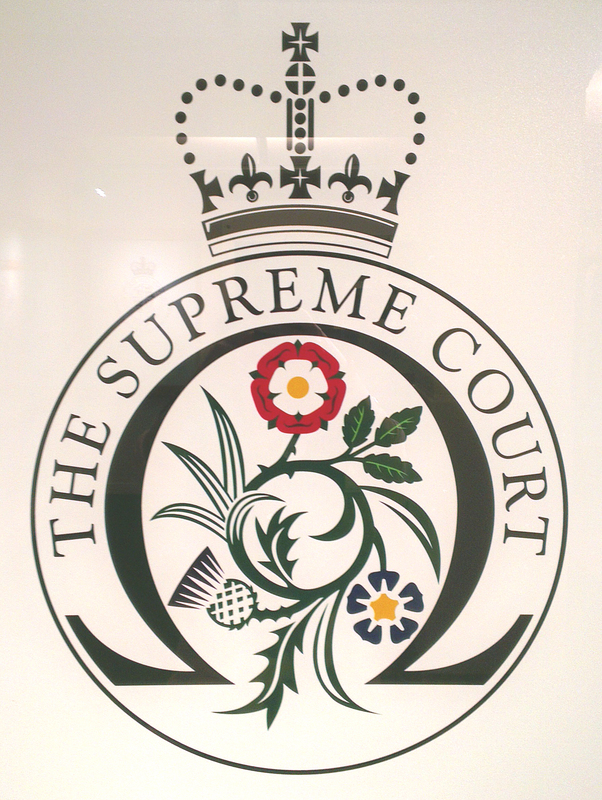 The Supreme Court’s official emblem. Wales: “The green leaves of a leek, deriving from the medieval legend that St David ordered his Welsh soldiers to wear leeks on their helmets during a battle against the Saxons.” All four symbols placed inside an almost circular frame depicting Libra, the scales of justice, and Omega, representing finality. These four symbols were also integrated into the carpet’s design – specially designed by Sir Peter Blake who is better known as the designer for the album cover of the Beatles “Sergeant Pepper’s Lonely Hearts Club Band”. 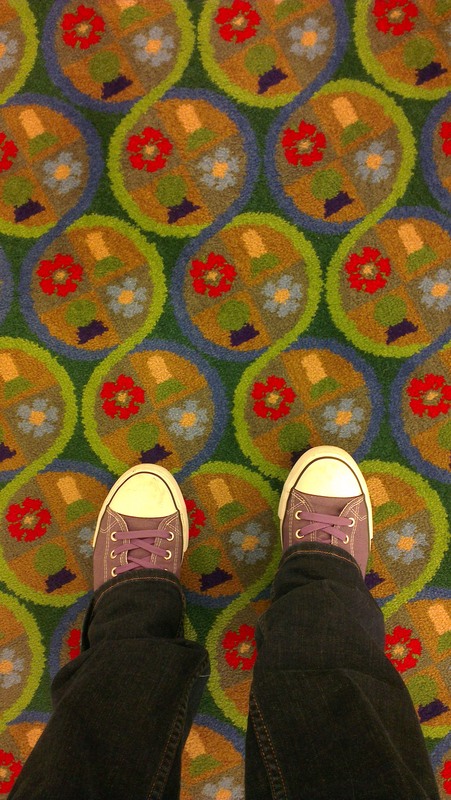 The carpet reflected his personality and era in a psychedelic sense which seemed quite groovy. A relative question regarding the design was raised; If Scotland was to gain independence what would happen to the symbol that represented Scotland on the emblem?? The answer which was not expected, was one of that the emblem would have to be redesigned (to remove the symbol) and the carpet would also have to be replaced! If needs be, needs must. The Supreme Court poem was written by Sir Andrew Motion, Poet Laureate between 1999 – 2009, to mark the creation of the Supreme Court. And square the circle of a single court. By truth of principle and argument. The clarity time-honoured thinking brings. 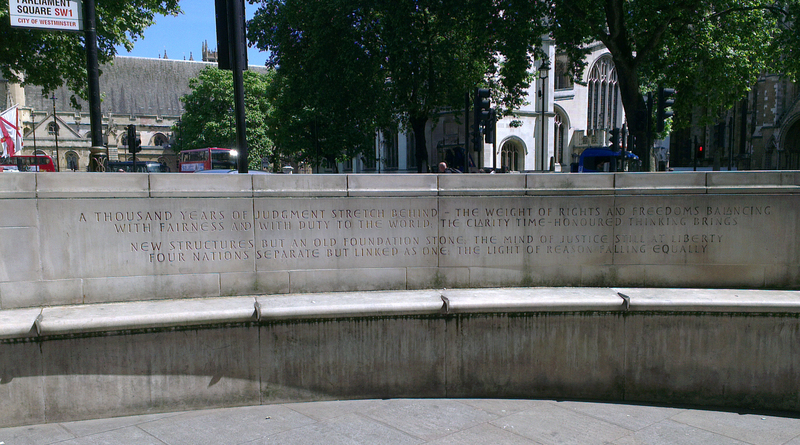 The poem is also inscribed on the semi-circular stone benches opposite the main entrance. The Library which is not open to the public was such a privilege to view, just being allowed inside. There was even a book on display from 1661! The whole building and tour experience left me feeling extremely grateful to be on their very first try out tour. There was a mixture of humour, education, technology and history. My goodness, if my history teacher could read this now – she would be rendered speechless! So thank you ever so, to the staff of STAGETEXT and to Simon especially, who was our guide. He had a lot of patience and the right customer service skills needed. All the best and we shall look forwards to more.